An obsession, a love story, family dysfunction and a two century-old mystery combine in the witty and deeply moving play 33 Variations, a theatrical event that brings together the most prestigious cast ever assembled on an Australian stage. Dr Katherine Brandt is a musicologist trying to solve the riddle of why one of the world’s greatest musical geniuses became consumed by a forgettable piece of music by a mediocre composer, and how his obsession inspired a spectacular masterpiece. Moving between the past and present, the play interweaves Beethoven’s struggle to complete his magnificent Diabelli Variations with Katherine’s search for answers. Meanwhile, Katherine’s daughter Clara seeks to connect with her mother as they face the greatest challenge of their lives. 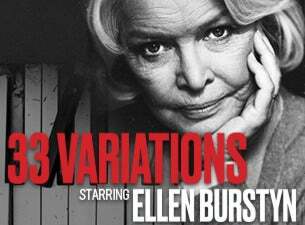 Starring in a role made famous by Jane Fonda on Broadway is Ellen Burstyn, the legendary Oscar, Tony and Emmy Award winning actress known for The Exorcist, Alice Doesn’t Live Here Anymore, Requiem for a Dream and most recently, Netflix’s House of Cards. Joining her in a sensational ensemble is Lisa McCune as Clara, William McInnes as Beethoven, Helen Morse, Francis Greenslade, Toby Truslove and Andre de Vanny. Featuring live performances of Beethoven’s magnificent music by renowned pianist Andrea Katz, the profound 33 Variations will be one of the theatrical highlights of 2019!